A woman can never have too many purses. 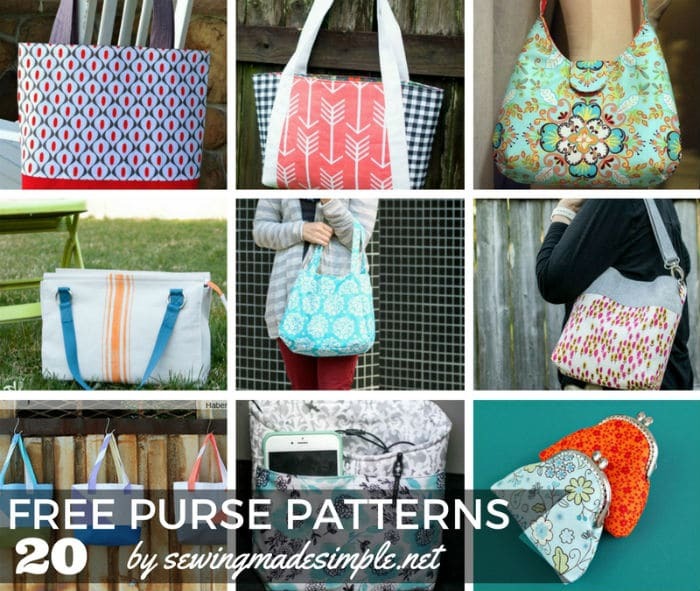 If you are looking for a new purse project to complete with your sewing machine, here are 20 purses, handbags, totes and messenger bag patterns that you can try for free. You will definitely find the bag design you are looking for, and a few extra for those special occasions. This cross body tote has a nice long strap so you can wear it across your body securely. It features a front pocket where you can stow your money, car keys or phone as it will be in easy reach. This Ethel tote features a nice deep center pocket where you can keep your bottle of water, small wallet and other items. You'll love all the pockets it has. Here are some great clutch and tote patterns when you are looking for a smaller purse to carry around when running daily errands. Messenger bags are great totes when you need to carry heavy or bulky objects that can't be folded up such as books, magazines, laptops and tablets. This car diddy bag is perfect to have in your vehicle as it keeps the interior nice and tidy as everything is within arm's reach. This block zipper pouch bag is incredibly easy to make and can hold an amazing amount of stuff inside. These adorable little coin purses are perfect when you don't want to dig for change from the bottom of your regular bag. There are plenty of exterior pockets so you can carry even more stuff in this bag. I wonder if mermaids carry purses? If they do, it might look like this fabric fish purse as it is the perfect purse for girls of all ages. These zippered clutch purses come with a nice strap as you will carry it when you are out and about with your girlfriends. Here is another Ethel Tote from Swoon, yet this free pattern can show you how to sew on pockets in the front. Do you like the look of folded purses? This Tolt folded bag pattern will show you how to fold fabric to make one. Sometimes you need one on the big purses to get through those weekend trips. The weekender tote bag will provide all the room you need. This adorable crochet purse makes the perfect gift for young and old. When you are looking for more of a vintage yet stylish purse, the drop cloth purse is a wonderful sewing project. These pretty carry bags not only make the best purses for everyday use, but are also just right to carry your things during plane flights. Accordion folded wallets have never gone out of style as these purses can carry money, credit cards and other small items. When you are doing outdoor recreational activities, you want to have all the essentials on hand. Leave your daily purse behind and instead use this roomy picnic tote. The Phoebe bag has a simple strap to close the top as you can wear this stylish bag during your shopping trips. When you want to get creative by using multiple fabrics, you can try your hand at creating this color block fabric handbag. It's incredible that there are so many handbags available that you can sew. Pick out your favorites as you will be sewing a new bag that you can use for each day of the month. Want to make purse and sell it? Why not?! I have friends who do sewing for a living. If you want to do this as a side job,I suggest you get the best sewing machine for heavy fabric. Who knows your business may take off and start getting a lot of orders before you know it. If that happens, you can afford to have an upgrade and get yourself a﻿n ﻿﻿﻿﻿i﻿ndustria﻿﻿l sew﻿﻿i﻿﻿ng﻿ machine﻿﻿.